There’s a weird amount of amazing things on TV right now. Like, I don’t even know how I get anything done. With the weekend upon us, I wanted to share the shows I’ve killed lately, in hopes that you, too, would share what you’ve been loving. 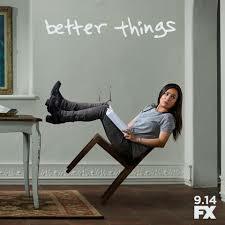 Better Things: Two seasons on FX. Comedy. Louis CK had something to do with it but please disregard because then you will miss falling in love with Pamela Adlon, who created and wrote. She plays a single mom to three girls and my daughters and I LOVED it. Like, obsessed, especially with the Season 2 finale. Marvelous Mrs. Maisel: One season on Amazon. Eight episodes about an hour each. Late 1950s NYC comedy scene and the young, Jewish housewife who’s trying to break in. Written by Gilmore Girl creator Amy Sherman-Palladino who cast the amazing Tony Shaloub as the dad. Really wonderful and, as is her wont, dialogue galore courtesy of Palladino. Somebody Feed Phil: Six, one-hour episodes on Netflix. He’s the creator of Everybody Loves Raymond but my girls don’t know what that is. They just think the nerdy Jewish dude who travels and eats his way through six different locations is hilarious. We binged it last weekend. Now, I totally need to go to Thailand and Lisbon (he also goes to Israel, Vietnam, New Orleans and Mexico City). Fun. Poldark: Three frothy seasons on PBS. I mean, what’s more fun than a period Masterpiece Theater piece with a cute guy galloping around the Cornish seaside? The main guy’s from The Hobbit and any time he appeared sans shirt, my daughter and I would yell, “Hunky Hobbit”! I mean, we thought we were funny. The Crown: Two seasons on Netflix. Like, duh. Everyone loves it. This season, we get to see what a PIA Phillip was back in the day. Big Daddy doesn’t like to be anyone’s subject. Especially his wife’s. Victoria: Two seasons on Masterpiece Theater. Speaking of which, turns out good old Albert didn’t much like taking a back seat to his queen, either. Just started back up on PBS last weekend so there’s plenty of time to catch up. Plus, you can help me bring Victoria’s hairstyle back. I used to call it my “Jane Eyre” look, but now it’s “The Vicky” or “Queen.” Now, all I need is a crown. Okay, not quite sure what I should start watching next. Please, by all means, give me some suggestions!! This entry was posted in Friday Faves and tagged Amazon, masterpiece theater, Netflix, pbs, TV binging. Bookmark the permalink. So Black Mirror is a creepy, cool show about when technology goes amiss. And Laura Linney and Jason Bateman are in Ozark so how bad can that be?? And I am thinking of adding Unbreakable Kimmy Schmidt and Master of None to the binge-watching pile. Thanks for the heads up. Try on Netflix, The Tudors, Reign, Hell on Wheels, Happy Valley and Longmire. They were all great. Enjoy! Please say hi to your mom for me. LOVED The Crown! And will have to check out some of these. Currently, I’m watching How to Get Away With Murder on Netflix and am excited that there is a new season of Grace and Frankie on Netflix. With you on poldark. Can’t get enough. Grace and Frankie on Netflix is very funny. Have the crown up next in my cue. If you’re looking for dark Ozark will give that to you. Whatever you do, do not watch Gypsy, starring Naomi Watts, on Netflix. It is cosmically bad. I can’t believe she signed on for it. Really really awful. Naomi Watts is on a Netflix show? It must be terrible if they’re not promoting it and I’ve never heard of it! Thanks for the heads up (and for reading and warning us)!! I’m ashamed to say my 15-year-old son and I binge-watched “American Vandal” on Netflix. Pretty funny. Also if you haven’t already, I recommend “My Next Guest” with David Letterman, “The Big Sick” and the Judd Apatow comedy special. Currently trying to find a way to watch “Big Little Lies” without paying for HBO. Mrs. Maisel is a personal favorite but keep an eye out for Mozart in the Jungle in March. Hi Charles!!! Oh, I’m glad you love Midge as much as I do! And my daughter and I already binged the whole new season of Mozart in the Jungle, another one of my faves!! Huzzah! I haven’t gotten to Mozart yet, I’m trying to finish up Electric Dreams. Don’t telll me nothin’ Wednesday.